A young innovative company, Leverage Point has launched its latest innovation, the "eDoctor's Note",eDoctors note was mainly designed to deal with fictitious fraudulent sick notes, to deal with absenteeism and to some way bring credibility to the doctor's sick note". Are you sick and tired of your employees being absent from work every Monday? Well there could be a remedy for that that could even see them being sick and fired! Yes, a new app called EDoctorsNote helps employers and Doctors keep track of sick notes. 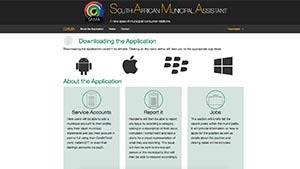 It’s interesting to see that several of SA’s municipalities and other government departments are seeing the value in crowd-sourced apps that allow the public to use their phones to capture issues such as accidents, pot holes, burst water pipes, etc.